HOUSTON (KTRK) -- Vanessa Hughes' Garden Oaks home is clean. Her back account is $2,000 lighter, but the remnants of an explosive sewage leak from spring 2015 are gone. Hughes is still fighting to get the city to pay for it. The city just told her it's not going to happen. We first met Hughes when we investigated the process of fighting Houston City Hall to get money when city crews damage your property. (You can see that investigation here.) At that point, Hughes was hopeful the city would pay up. Hughes tells us a city crew was outside her home clearing a sewer line with a massive city truck. She heard loud noises from the empty downstairs bathroom. And when she opened it, "It was like hitting a wall of stench when you walked near the bathrooms." Her boyfriend, James Supak calls it "the worst smell I've ever smelled." He told us he nearly passed out. Then he tells us he ran down the street and told the crew to shut the machine down. 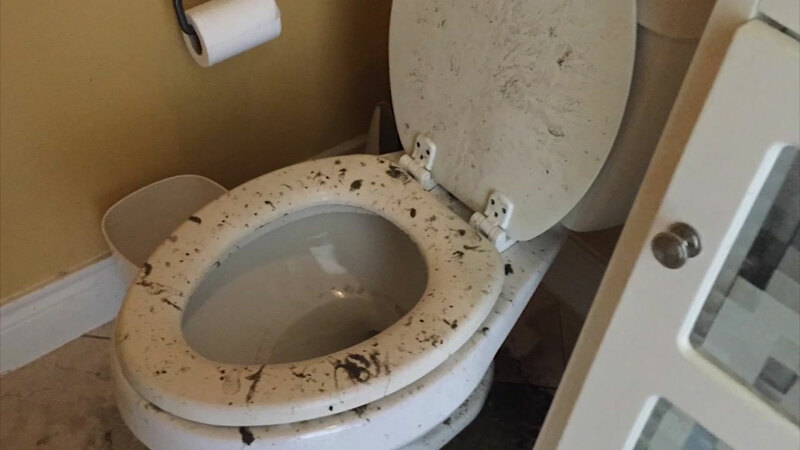 Almost immediately, the explosive sewage fountain stopped flowing into Hughes home through her toilets. Hughes called in a HAZ-MAT crew to clean up the bio-hazardous mess and followed procedures to send the $1,900 bill to the city. State law specifically says Texas cities are not liable for blocked sewer lines. That is designed to save taxpayers money when old pipes get clogged through no fault of the government. But this summer Harlan Heilman, an attorney for the City of Houston, explained to us, "if it is caused by someone trying to clear the line, that is another scenario that we have to look at." Since it only started when the motor driven city truck started pumping, Hughes was optimistic until the city denial came. The City Attorney's office tells abc13: "The City is disputing the underlying facts as presented by Ms. Hughes. The City employees that responded to her residence advise 'the sanitary sewer was overflowing inside the residence before the PWE stoppage team responded.' Consequently, while the City used equipment to clear the main, it is our position that Ms. Hughes' damage occurred prior to the use of the equipment. Thus, we denied liability based upon governmental immunity." Supak, Hughes boyfriend, called that, "the biggest lie I've ever heard from the city." Hughes said, "They just made that up." She tells us the only time she ever called the city about sewage problems before this incident was when a city drain overflowed in a heavy rain storm. She denied any problems and questioned how the city would even know what was happening in her house before the explosive leak. She tells us city employees were never in her house. Reminded that it is never easy to fight city hall, Hughes tells us her next step is to hire a lawyer and "hope the city does the right thing."